I feel like I have always known how to cook turnips. We have always grown this vegetable in our garden. They are called tubers or root crops meaning that they grow under the ground. Some seasons we would produce so many of them that Mom cooked them quite often. They are like potatoes recipes in the fact that they can be eaten in many different ways. This includes eating them raw which we also did with potatoes and parsnips when I was young. If you know anything about how to cook turnips, you probably know that this is one of those great vegetables which have the tops turnips greens that are very edible and delicious; of course the root or tuber which is also edible. Like potatoes, the turnip root is more on the starchy side where the green leaves are not. Like most vegetable recipes the nutritional value of turnips make it worth your while to learn many of the different ways of how to cook turnips. Generally speaking, because of the hardiness of this crop and the easy available it is one of the more economical foods to enjoy at harvest time. Some of the turnips are routinely harvested when young and sweet. Other turnips are left in the fields to mature; the skins toughen making them easy to store and ship like we do potatoes. These should be stored unwashed; excess moisture will encourage decay. After harvesting, cut off the leaves so they will not draw out the moisture from the roots; leave about 2 inches of the stem. For learning how to cook turnips you also need to know to purchase them if you are not growing your own. Any that you buy should be firm. Like other tubers they should not have any blemishes visible to your eyes. 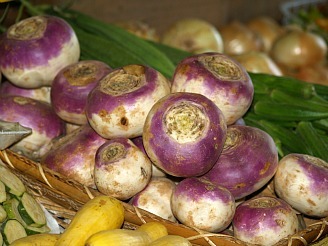 Turnips should be small; no larger than two inches in diameter. Larger ones become bitter, tough and fibrous. As I said earlier to learn how to cook turnips is just following all the ways you cook other root vegetables like potatoes. Turnips are delicious fried; just slice thinly and put them in a skillet with hot fat. 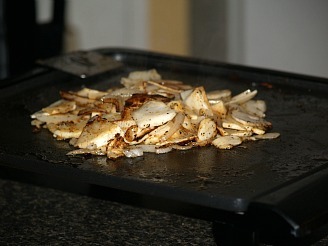 Bacon grease adds a lot of flavor when cooking any vegetable and this is true when it comes to frying sliced turnips. Wash and dry 4 to 5 turnips; slice very thin. Peel and slice 1 medium onion. Melt and heat butter or bacon drippings until hot. Add sliced vegetables; fry on both sides until browned. Sprinkle with salt and pepper and serve hot. They can also be boiled, steamed baked and grilled. Of these grilling them is my favorite way because they take on that delicious grilled flavor. Many of my family loved them just boiled plain and then covered with good fresh butter but this is not one of my favorite ways. After I spent many years perfecting how to cook turnips, I found my favorite way is to add them in with other vegetables. I especially like to blend them in recipes with potatoes; they make a perfect match. 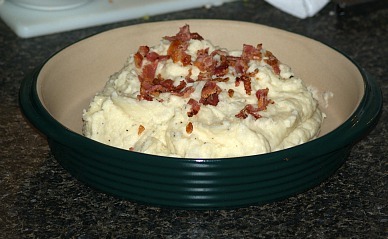 The stronger flavor of turnips really adds to the plainer taste of potatoes; add good butter and it is really a treat. Fry 2 slices of bacon until crisp; drain on a paper towel and crumble. Peel and quarter two large turnips and two large potatoes; simmer together in a pot until tender. Drain vegetables and place in mixing bowl. Add melted butter to taste, salt and pepper; beat until whipped and fluffy. Spread crumbled bacon over top and some grated cheddar cheese. Serve immediately. 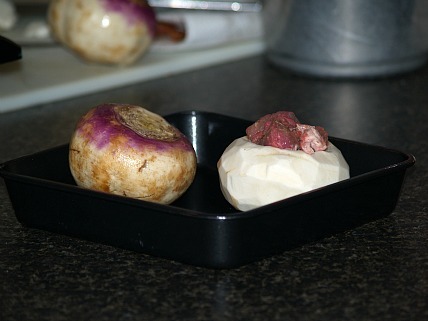 When you learn how to cook turnips you might want to combine them in other root vegetable recipes. Combine all vegetables and apple in a large bowl. Stir in mayonnaise; season with salt, pepper and celery seed to taste. Try adding other root vegetables in this recipe. Peel turnips and coarsely shred; place in medium bowl. Add lemon juice, salt and pepper; toss to blend. Let set about 30 minutes; add watercress to turnip mixture. Blend mustard and mayonnaise together in a small bowl; add to salad. 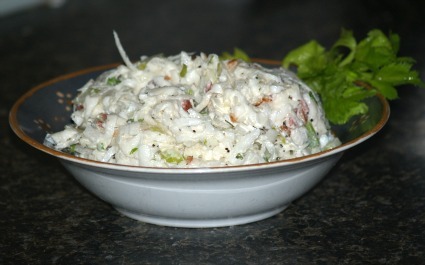 Mix salad until well blended with dressing; serve immediately. Peel turnips and hollow out the center. Blanch hollow turnips and the pulp from the centers in boiling water for a few minutes; drain. Mix together pork, bacon, shallot and 2 tablespoons herbs; season with salt and pepper. Add egg to pork mixture and stir to blend; firmly pack stuffing in hollow turnips. Brown turnips in melted butter in heavy Dutch oven over medium heat. Add stock and cider to the turnips in the Dutch oven; cover with lid and simmer about 1 hour. Fifteen minutes before serving puree in blender the pulp from the hollow turnips. Add puree to the liquid in the Dutch oven and continue cooking 15 minutes longer. Arrange turnips on warm serving platter; cover and keep warm. Over high heat cook liquid until reduced in half; beat egg yolk into liquid. Strain liquid and add seasoning if needed; coat turnips with hot sauce and serve.